A look at our Bible verse eye black. 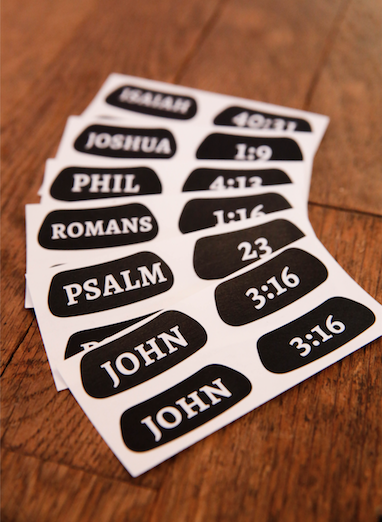 Our Bible verse eye black designs are always popular items for athletes of faith to wear on the field. We recently created several new verse designs for the Christian athlete to wear on the football, softball, baseball, or lacrosse field. Take a look at the athlete Bible verses featured. Isaiah 40:31 Eye Black - “But those who hope in the Lord will renew their strength. They will soar on wings like eagles; they will run and not grow weary, they will walk and not be faint.” This popular verse is especially inspirational for athletes who believe that they can tap into a deeper strength and endurance. Joshua 1:9 Eye Black - “Have I not commanded you? Be strong and courageous. Do not be afraid; do not be discouraged, for the Lord your God will be with you wherever you go.” This verse also serves as great athletic inspiration. No matter your size or skill level, this verse can inspire you be strong and courageous in everything you do. Romans 1:16 Eye Black - “For I am not ashamed of the gospel, because it is the power of God that brings salvation to everyone who believes.” This verse is a powerful declaration for the Christian athlete seeking to show his or her faith on the field.